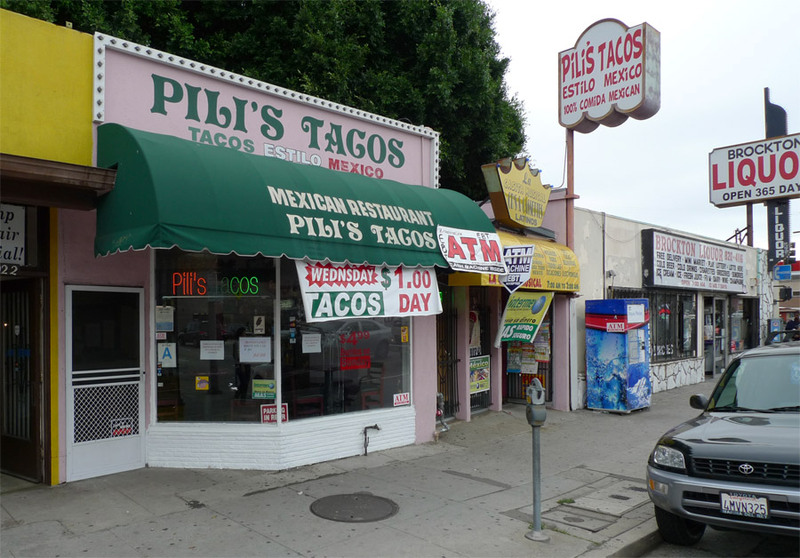 I first heard of Pili’s years ago when UCLA architecture schoolmate Antonio recommended it for its righteous tacos, obviously a rarity west of the 405. It is a cozy little storefront connected to an adjoining gift shop, offering fine tacos until late at night. Carmen and I found an excuse to head out here for lunch today. The word “Pili’s” has great ear-feel to my gringo ears. I ordered one each of the al pastor, carnitas, and carne asada tacos, Westside-priced at $1.50 each for slightly smallish tacos. 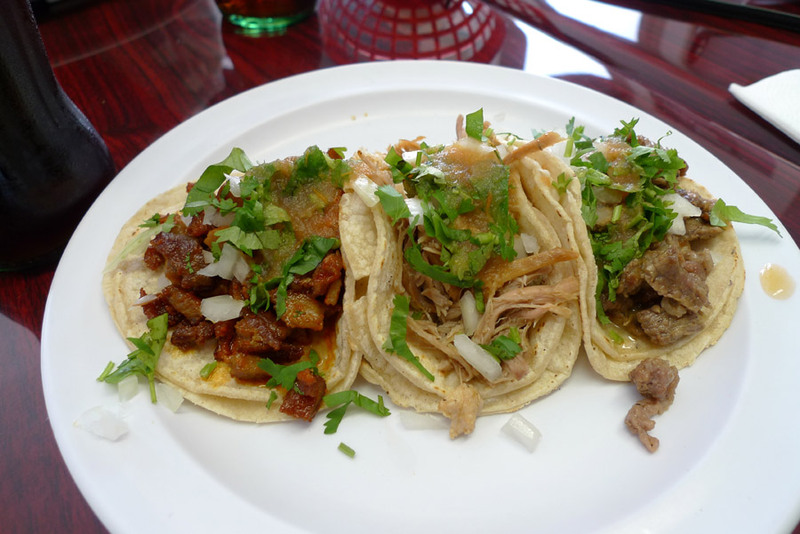 They were plated nicely, the three tacos aligned on a plate, tortillas leaning into one another, implying the roundish cross section of a taco curled in the hand on its way to the mouth. I started with the steak. This taco felt good from the start, with the small, bilaminated tortillas nicely leathered but not oily. The steak had a great flavor and texture, sparely seasoned and a bit gamy due to relatively fatty meat – fatty in a good way. Next I ate the carnitas taco, my least favorite. The meat had a good texture with enough resistance to satisfy the tooth, but rather dry in a way that leaves your tongue feeling desiccated. The flavor isn’t bad – it’s definitely pork – but it’s neither strong nor compelling enough. Lastly I ate the al pastor taco. It’s well above-average al pastor meat, not the typical stuff, but small cuboid chunks of pork apparently deep-fried to a near-crunchy resilience, with some orange savory flavor added for good effect. It has a winning porky-oily flavor that made me ponder whether I needed another one. the tacos are pretty good here for west la. $1.50 is too much though $1 on wednesday sounds good. lol @ the sign FAIL though. What sign company doesn’t know how to spell wednesday .